I thought it was about time I introduced you all to the newest member of my family - Toby! No, unfortunately he's not mine - my mum and dad got him a little while ago (thanks to me and my persistence) and I couldn't resist telling you guys about him. You know I'm a little bit animal crazy and dogs in particular get me grinning from ear-to-ear - especially my baby Rory (if you're new to my blog you can read all about Rory here). Toby is seriously cute though and I just adore how much happiness and love a dog can bring into your life - I think I would have about ten if I could! 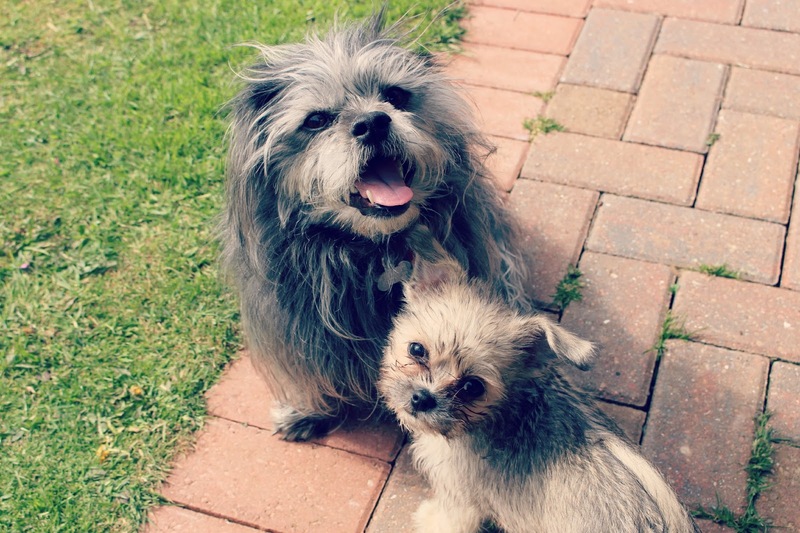 Toby is a Chihuahua x Shih tzu (Rory is a Chihuahua x Maltese so they're kind of related!) and he's the sweetest little thing ever. He's a very vocal little guy, always making little squeaks if he wants something, and he varies from having bundles of energy to sleeping - anywhere and everywhere! He's a few months old now and growing all the time - I have a feeling he'll be a tad bit bigger than Rory but we'll see. Him and Rory get on well although Toby does bully Rory a bit - but they do enjoy wrestling eachother constantly! I've said it before and I'll probably say it again - getting Rory was the best decision I ever made and I know my mum and dad feel the same about Toby (even when he wees in the house - he's learning though!) Dogs have an ability to bring so much love it's unreal, and it's so nice to have a little furry companion following you about the place. They both just make my heart melt! I will say, if you are thinking about getting a puppy - think long and hard. They are honestly such a joy but they can be hard work too, and there are a million different things to consider when you get one. You'll spend a lot of money on kitting them out with beds, food, leads, collars, toys etc. and then there's insurance too (which is SO important - my mum and dad are thinking about going for More Than insurance for Toby) and of course the time, energy and patience it takes training them, walking them and just generally looking after them. Are they worth it? Of course, but it totally depends on who you are as a person and whether a dog will fit into your lifestyle. I'm so happy my mum and dad decided to get Toby - he's such a little character (just like Rory) and it's going to be so exciting seeing him grow. Aw, don't you just love dogs? !